Not to be confused with Clozure CL, Google Closure Tools, or Closure (computer programming). Clojure (/ˈkloʊʒər/, like closure) is a modern, dynamic, and functional dialect of the Lisp programming language on the Java platform. Like other Lisps, Clojure treats code as data and has a Lisp macro system. The current development process is community-driven, overseen by Rich Hickey as its benevolent dictator for life (BDFL). Clojure advocates immutability and immutable data structures and encourages programmers to be explicit about managing identity and its states. This focus on programming with immutable values and explicit progression-of-time constructs is intended to facilitate developing more robust programs, especially multithreaded ones. While its type system is entirely dynamic, recent efforts have also sought the implementation of gradual typing. Commercial support for Clojure is provided by Cognitect. Annual Clojure conferences are organised every year across the globe, the most famous of them being Clojure/conj (US east coast), Clojure/West (US west coast), and EuroClojure (Europe). Rich Hickey is the creator of the Clojure language. Before Clojure, he developed dotLisp, a similar project based on the .NET platform, and three earlier attempts to provide interoperability between Lisp and Java: a Java foreign language interface for Common Lisp (jfli), A Foreign Object Interface for Lisp (FOIL), and a Lisp-friendly interface to Java Servlets (Lisplets). Hickey spent about 2½ years working on Clojure before releasing it publicly, much of that time working exclusively on Clojure with no outside funding. At the end of this time, Hickey sent an email announcing the language to some friends in the Common Lisp community. The development process is community-driven and is managed at the Clojure Community website. The website contains planning documents and an issue tracker where bugs may be filed. General development discussion occurs at the Clojure Dev Google Group. Anyone can submit bug reports and ideas, but to contribute patches, one must sign the Clojure Contributor agreement. JIRA tickets are processed by a team of screeners and finally Rich Hickey approves the changes. Clojure's approach to state is characterized by the concept of identities, which are represented as a series of immutable states over time. Since states are immutable values, any number of workers can operate on them in parallel, and concurrency becomes a question of managing changes from one state to another. For this purpose, Clojure provides several mutable reference types, each having well-defined semantics for the transition between states. Clojure runs on the Java platform and as a result, integrates with Java and fully supports calling Java code from Clojure, and Clojure code can be called from Java also. The community uses Leiningen for project automation, providing support for Maven integration. Leiningen handles project package management and dependencies and is configured using Clojure syntax. Like most other Lisps, Clojure's syntax is built on S-expressions that are first parsed into data structures by a reader before being compiled. Clojure's reader supports literal syntax for maps, sets and vectors in addition to lists, and these are compiled to the mentioned structures directly. Clojure is a Lisp-1 and is not intended to be code-compatible with other dialects of Lisp, since it uses its own set of data structures incompatible with other Lisps. As a Lisp dialect, Clojure supports functions as first-class objects, a read–eval–print loop (REPL), and a macro system. Clojure's Lisp macro system is very similar to that in Common Lisp with the exception that Clojure's version of the backquote (termed "syntax quote") qualifies symbols with their namespace. This helps prevent unintended name capture, as binding to namespace-qualified names is forbidden. It is possible to force a capturing macro expansion, but it must be done explicitly. Clojure does not allow user-defined reader macros, but the reader supports a more constrained form of syntactic extension. Clojure supports multimethods and for interface-like abstractions has a protocol based polymorphism and data type system using records, providing high-performance and dynamic polymorphism designed to avoid the expression problem. Clojure has support for lazy sequences and encourages the principle of immutability and persistent data structures. As a functional language, emphasis is placed on recursion and higher-order functions instead of side-effect-based looping. Automatic tail call optimization is not supported as the JVM does not support it natively; it is possible to do so explicitly by using the recur keyword. For parallel and concurrent programming Clojure provides software transactional memory, a reactive agent system, and channel-based concurrent programming. Clojure 1.7 introduced reader conditionals by allowing the embedding of Clojure and ClojureScript code in the same namespace. Transducers were added as a method for composing transformations. Transducers enable higher-order functions such as map and fold to generalize over any source of input data. While traditionally these functions operate on sequences, transducers allow them to work on channels and let the user define their own models for transduction. The primary platform of Clojure is Java, but other target implementations exist. The most notable of these are ClojureScript, which compiles to ECMAScript 3, and ClojureCLR, a full port on the .NET platform, interoperable with its ecosystem. A survey of the Clojure community with 1,060 respondents conducted in 2013 found that 47% of respondents used both Clojure and ClojureScript when working with Clojure. In 2014 this number had increased to 55%, in 2015, based on 2,445 respondents, to 66%. Popular ClojureScript projects include implementations of the React library such as Reagent and Om. In the "JVM Ecsosystem Report 2018" (which was claimed to be "the largest survey ever of Java developers"), prepared in collaboration by Snyk and Java Magazine, Clojure was ranked the 2nd most used programming language (behind Java) for "main applications". Clojure is used in industry by firms such as Apple, Atlassian, Funding Circle, Netflix, Puppet, and Walmart as well as government agencies such as NASA. It has also been used for creative computing, including visual art, music, games, and poetry. ThoughtWorks, while assessing functional programming languages for their Technology Radar, expressed their favor toward Clojure as "a simple, elegant implementation of Lisp on the JVM" in 2010 and promoted its status to "ADOPT" in 2012. "remainder of dividing numerator by denominator." "Returns a distinct numeric ID for each call." "Evaluates the given `forms` with all printing to `*out*` silenced." ^ "Index of /maven2/org/clojure/clojure/1.10.0/". repo1.maven.org. 2018-12-17. Retrieved 2018-12-17. ^ Fogus, Michael. "Rich Hickey Q&A". CodeQuarterly.com. Retrieved 2017-01-11. ^ Hickey, Rich. "Clojure Bookshelf". Listmania!. Amazon.com. Retrieved 2017-10-03. ^ Bonnaire-Sergeant, Ambrose (2012). A Practical Optional Type System for Clojure (Thesis). The University of Western Australia. ^ "Clojure Programming" (PDF). Retrieved 2013-04-30. ^ Hickey, Rich. "meaning and pronunciation of Clojure". Google Groups. Retrieved 2012-04-20. ^ a b Krill, Paul. "Clojure inventor Hickey now aims for Android". www.infoworld.com. Retrieved 2018-11-08. ^ a b "Clojure – home". Clojure.org. Retrieved 2015-09-15. ^ "Clojure – Lisp". Clojure.org. Retrieved 2015-09-15. ^ a b "Contributing FAQ – Clojure Community – Clojure Development". dev.clojure.org. Retrieved 2015-09-15. ^ "Clojure – funding". Clojure.org. Retrieved 2015-09-15. ^ a b "Clojure – state". Clojure.org. Retrieved 2015-09-15. ^ a b Hickey, Rich. "Rationale". Clojure.org. Retrieved 2008-10-17. ^ a b Charles (2009-10-06). "Expert to Expert: Rich Hickey and Brian Beckman – Inside Clojure; Going Deep; Channel 9". Channel9.msdn.com. Retrieved 2012-06-28. ^ "clojure/core.typed". GitHub. Retrieved 2015-09-15. ^ "Clojure Programming Language: Cognitect, Clojure Consulting, Clojure Support, Functional Programming, JVM". Cognitect.com. Retrieved 2015-09-15. ^ "[ANN] dotLisp – a Lisp dialect for .Net". Google Groups. ^ "jfli, a Java foreign language interface for Common Lisp". ^ "Foil – a Foreign Object Interface for Lisp". ^ "Lisplets – a Lisp-friendly interface to Java Servlets". ^ "Contributing FAQ – Clojure Community – Clojure Development". dev.clojure.org. Retrieved 2015-09-16. ^ "JIRA workflow – Clojure Community – Clojure Development". dev.clojure.org. Retrieved 2015-09-16. 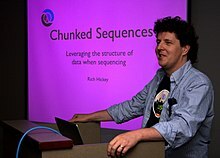 ^ "Economy Size Geek – Interview with Rich Hickey, Creator of Clojure". Linux Journal. Retrieved 2015-09-15. ^ a b Hickey, Rich. "On State and Identity". Clojure.org. Retrieved 2010-03-01. ^ "Clojure: Clojure is Two!". Clojure Blog. Retrieved 2015-09-16. ^ a b c d e f Fingerhut, Andy. "Clojure version history". jafingerhut.github.io. Retrieved 2015-09-16. ^ "Clojure: Clojure 1.0". Clojure Blog. Retrieved 2015-09-16. ^ "Clojure: Clojure 1.1 Release". clojure.blogspot.com. Retrieved 2015-09-16. ^ "Clojure – protocols". Clojure.org. Retrieved 2015-09-16. ^ "Clojure/clojure". GitHub. Retrieved 2015-09-16. ^ "Google Groups". groups.google.com. Retrieved 2015-09-16. ^ a b "Clojure 1.9". Cognitect. Retrieved 2017-12-08. ^ "Google Groups". groups.google.com. Retrieved 2016-01-25. ^ "Google Groups". groups.google.com. Retrieved 2017-12-08. ^ "Clojure 1.10 release". clojure.org. Retrieved 2018-12-17. ^ a b "Clojure – jvm_hosted". Clojure.org. Retrieved 2015-09-15. ^ "Clojure – java_interop". Clojure.org. Retrieved 2015-09-15. ^ a b Hagelberg, Phil; contributors. "Leiningen". leiningen.org. Retrieved 2015-09-15. ^ a b c "Clojure – reader". Clojure.org. Retrieved 2015-09-15. ^ "Clojure – Lisps". Clojure.org. Retrieved 2015-09-15. ^ "Clojure – macros". Clojure.org. Retrieved 2015-09-15. ^ Hickey, Rich. "edn". GitHub. Retrieved 2014-05-24. ^ "Clojure – multimethods". Clojure.org. Retrieved 2015-09-15. ^ "Clojure – protocols". Clojure.org. Retrieved 2015-09-15. ^ "Clojure – datatypes". Clojure.org. Retrieved 2015-09-15. ^ Goetz, Brian. "Brian Goetz – Stewardship: the Sobering Parts". YouTube: ClojureTV. Retrieved 2015-09-15. ^ Rose, John. "tail calls in the VM". blogs.oracle.com. Retrieved 2018-11-03. ^ Rose, John. "Some languages need to be able to perform tail calls". JDK Bug System. Retrieved 2018-11-03. ^ "Clojure – special_forms". Clojure.org. Retrieved 2015-09-15. ^ "Clojure – Refs". Clojure.org. Retrieved 2015-09-15. ^ "Clojure – Agents". Clojure.org. Retrieved 2016-07-04. ^ "Clojure: Clojure core.async Channels". Clojure.com. Retrieved 2015-09-15. ^ "Clojure – reader". Clojure.org. Retrieved 2015-09-15. ^ "Transducers" by Rich Hickey. https://www.youtube.com/watch?v=6mTbuzafcII. Retrieved on 2015-09-15. ^ "Transducers are Coming". Retrieved 2015-09-15. ^ "Rich Hickey – Inside Transducers". YouTube: Cognitect Inc. 2014-11-20. Retrieved 2015-09-15. ^ "Clojure/Clojurescript". GitHub. Retrieved 2015-09-15. ^ "clojure/clojure-clr". GitHub. Retrieved 2012-06-28. ^ Emerick, Chas. "Results of the 2013 State of Clojure & ClojureScript survey". Cemerick. Retrieved 2015-09-17. ^ "State of Clojure 2014 Survey Results". Cognitect Blog. Retrieved 2015-09-17. ^ "State of Clojure 2015 Survey Results". Cognitect Blog. Retrieved 2016-09-08. ^ "Om: Enhancing Facebook's React with Immutability". InfoQ. Retrieved 2015-09-17. ^ "James Gostling meetup with London Java Community". 2016-10-11. Retrieved 2019-02-10. ^ Graham, Paul (2016-05-06). "Paul Graham on Twitter". Retrieved 2019-02-10. ^ Martin, Robert (2018-11-29). "Unble Bob Martin on Twitter". Retrieved 2019-02-10. ^ Maple, Simon; Binstock, Andrew (2018-10-17). "JVM Ecosystem Report 2018 - Synk". Retrieved 2019-02-10. ^ "Clojure - Success Stories". Clojure.org. Retrieved 2018-10-27. ^ "Roman Liutikov at Twitter". Twitter. Retrieved 2018-10-27. ^ "Jobs at Apple". Apple Inc. Retrieved 2018-10-27. ^ Borges, Leonardo (2015-07-07). "Realtime Collaboration with Clojure". Retrieved 2019-02-10. ^ "JUXT Blog: Clojure in London: Funding Circle". juxt.pro. Retrieved 2017-02-01. ^ Williams, Alex (2014-08-03). "The New Stack Makers: Adrian Cockcroft on Sun, Netflix, Clojure, Go, Docker and More". Retrieved 2019-02-10. ^ "A New Era of Application Services at Puppet Labs". Puppet Labs. Retrieved 2015-09-15. ^ "Walmart Runs Clojure at Scale". Cognitect.com. Retrieved 2015-09-15. ^ Meier, Carin. "Creative computing with Clojure". O'Reilly Radar. Retrieved 2015-09-17. ^ "Frequently Asked Questions - Technology Radar - ThoughtWorks". Retrieved 2019-02-10. ^ "Clojure - Technology Radar - ThoughtWorks". Retrieved 2019-02-10. ^ aemoncannon (2010-12-30). "Home: aemoncannon/las3r Wiki". GitHub. Retrieved 2012-06-28. ^ "drewr/clojure-py". GitHub. Retrieved 2017-01-10. ^ "rouge-lang/rouge". GitHub. Retrieved 2015-12-19. ^ "A Lisp on Perl". MetaCPAN. Retrieved 2014-05-25. ^ "Programming at the REPL: Introduction". clojure.org. Retrieved 2018-12-04. ^ Miller, Alex. ""State of Clojure 2018" Results". clojure.org. Retrieved 2018-12-09. ^ "CIDER: The Clojure Interactive Development Environment that Rocks". ^ "Cursive: IntelliJ IDEA plug-in for Clojure(Script)". ^ "fireplace.vim: Clojure REPL Support". ^ "Calva: Clojure(Script) Interactive Programming". ^ "LightTable: The Next Generation Code Editor". This page was last edited on 17 April 2019, at 21:36 (UTC).